What is the difference between LiMaS WebSuite and the Free Tools? LiMaS WebSuite is a professional web tool, which is periodically updated. Free Tools are Microsoft Excel applications, simpler and more limited than LiMaS WebSuite, and which were used as a basis for its development. They are not periodically updated. How much does LiMaS WebSuite cost? 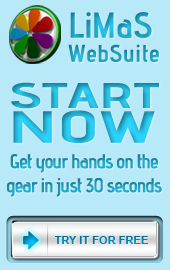 The current version of LiMaS WebSuite is a free trial version. To obtain it, you only have to register. The use and access to the final commercial version of LiMaS WebSuite is expected to have an associated fee. Which are the minimum hardware and software requirements to use LiMaS WebSuite? The basic hardware is a computer with internet access. The minimum screen resolution is 800 x 600. Which is the origin of LiMaS WebSuite? LiMaS WebSuite is the result of the LiMaS European Project (2009-2012) funded by EACI (CIP-EIP-Eco-Innovation 2008) and developed by SIMPPLE (coordinator), IK Ingeniería and Technische Universität Berlin. The project also included an advisory board, with Ihobe, GAIA, Fraunhofer IZM and Universitat Rovira i Virgili as its members. How is guarantee the security of my data? All data of your products is stored in a database protected by a password. This database is hosted on a server that also requires a privileged user account and corresponding password to access it. Regarding the passwords of the users of the LiMaS WebSuite, they are stored in an encrypted database based on the algorithm Bcrypt (http://en.wikipedia.org/wiki/Bcrypt). In this way, even the administrators of the database can not access the user’s original password. How long will be available the free version of the tools? The free tools, as they are right now, will be available for free at least until December 2013. You can use them for free during this period of time. If you are interested in a regularly updated version of the tools (e.g. new legislation, etc. ), please contact us. Can the tools be customised for my specific needs? We can customise these tools for your specific needs (e.g. multiple users, other specific modules, other format for questionnaires or graphics, etc.). Please contact us if you are interested in this service.